The Mars Curiosity Rover continues to make its way through the basin of Gale Crater on Mars. I’ve provided periodical updates on its progress as it makes its way toward a large mountain in the center of the crater. For the past six months the rover has not moved much, spending its days using the instruments on its arm to examine the rocks in the area. A few weeks ago it wrapped up its work there and has now begun traveling again. The goal is to head to the base of the huge mountain at the center of the crater. To get there it must cross over a strange landscape of small hills, valleys and large dune fields. From its current vantage point it has caught the best view yet of the mountains across the valley that are its final destination. Below I share some of my favorite pictures from the main camera on the rover sent back over the past couple of weeks and provide some short comments. All of these images are provided by NASA/JPL-Caltech. 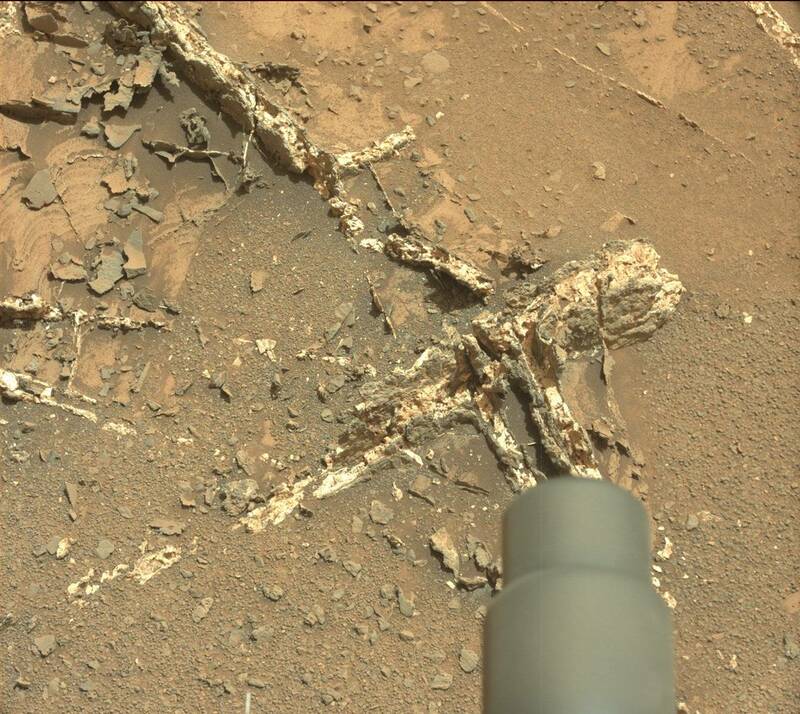 These were downloaded from either the Curiosity Rover raw images site hosted by NASA/JPL at http://mars.jpl.nasa.gov/msl/multimedia/raw/ or from Midnightplanets (http://www.midnightplanets.com/). The first two images below I have processed to remove some of the haze and sharpen the distant hills. Each day raw images from all of the cameras on board are uploaded to the JPL site for the public to see. In the image above there are multiple types of rocks and rock formations visible. the mountains in the distance are the foothills of Mt. Sharp an 18,000 foot mountain at the center of this crater. These hills are probably 10 to 15 thousand feet high themselves. I especially like the rock formation made of lighter colored rocks on the right. The apparent smooth erosion of this rock reminds me of the massive sandstone formations near Moab UT. 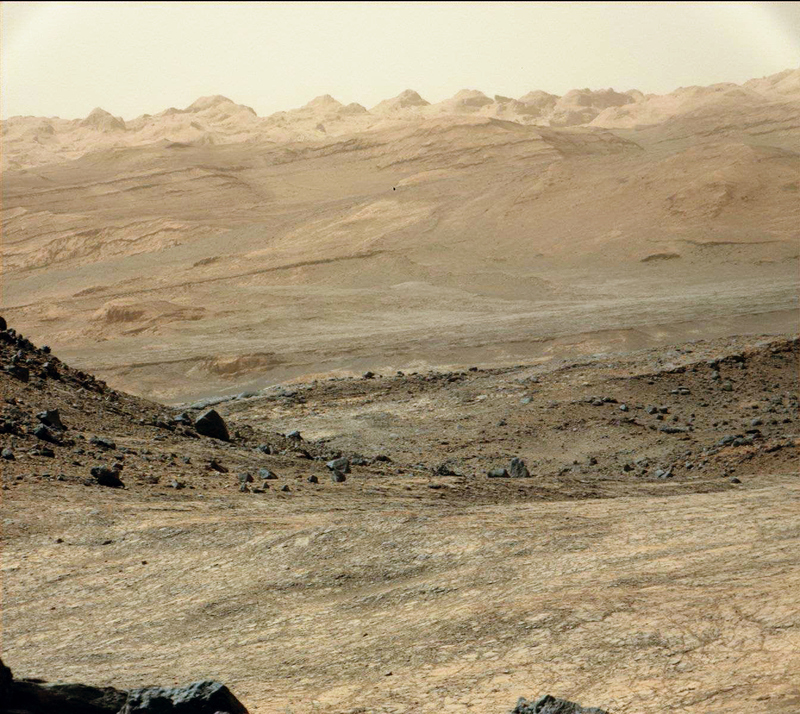 The varied formations testify of the great age of Mars. The crater itself is thought to have been formed more than 2 billion years ago and these mountains after that. The different types of rocks must have been formed under different conditions and we can infer that this region has undergone dramatic changes over long periods of time. At times new layers of sediments were being deposited and other times erosion has taking place. 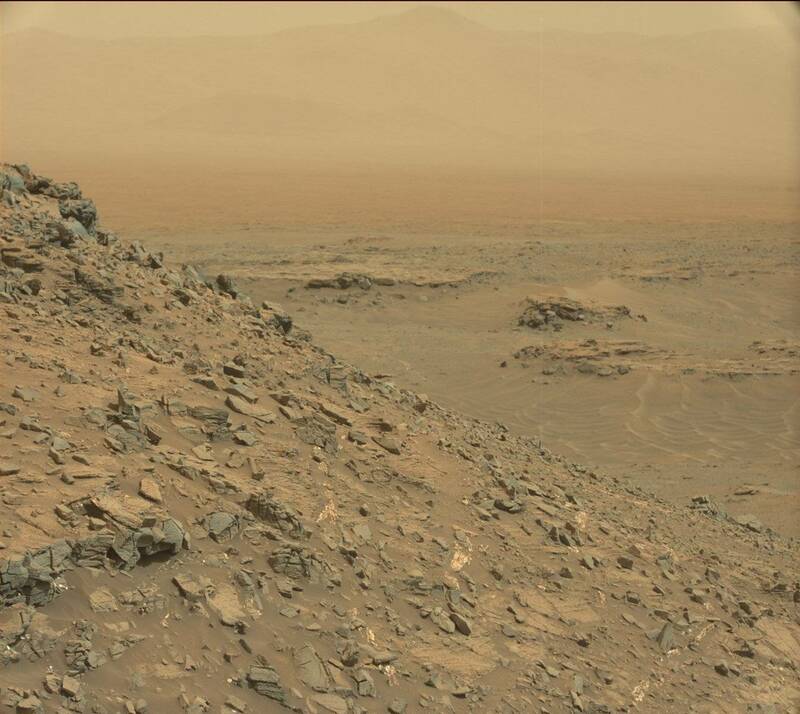 The volume of sedimentary rock Mars is quite astounding. Minimally thousands of feet of sedimentary rock are seen in this images. Given the present climate of Mars it is hard to imagine how such large amounts of material could be moved around, deposited and eroded. This is why past conditions are thought to have been quite different from those we witness in the present. Curiosity, Spirit and Opportunity rovers have all confirmed that past conditions were likely much wetter and the atmosphere on Mars likely much thicker. Even so, the great variety of rock compositions, textures, and formations speaks of an even more geologically complex history than I think most astrogeologists had hoped to find. Below is an image of Mt. Sharp looming up in the distance. It appears that you can see the peak but this is just a side of the mountain. If you reached the top of this “peak”you would find that there is another much higher peak behind this one. The entire upper portion of this mountain is made up a light colored rock that seems to be cross-bedded though that is not easily seen in this image. There is much debate about how this mountain might have formed but it seems to be sedimentary in origin rather than volcanic or metamorphic. Thus, the entire 18,000 foot mountain must have formed after the crater in which it sits was formed. Below are a series of images of the ground that the rover is driving over right now. There are conspicuous light-colored veins running through the rock and forming thin slivers of perpendicular rock jutting up out of the mostly flat surface. These veins are composed of various sulfates which are minerals that deposited by water. These veins almost certainly were produced by water seeping through the bed rock and precipitating our minerals in fractures. 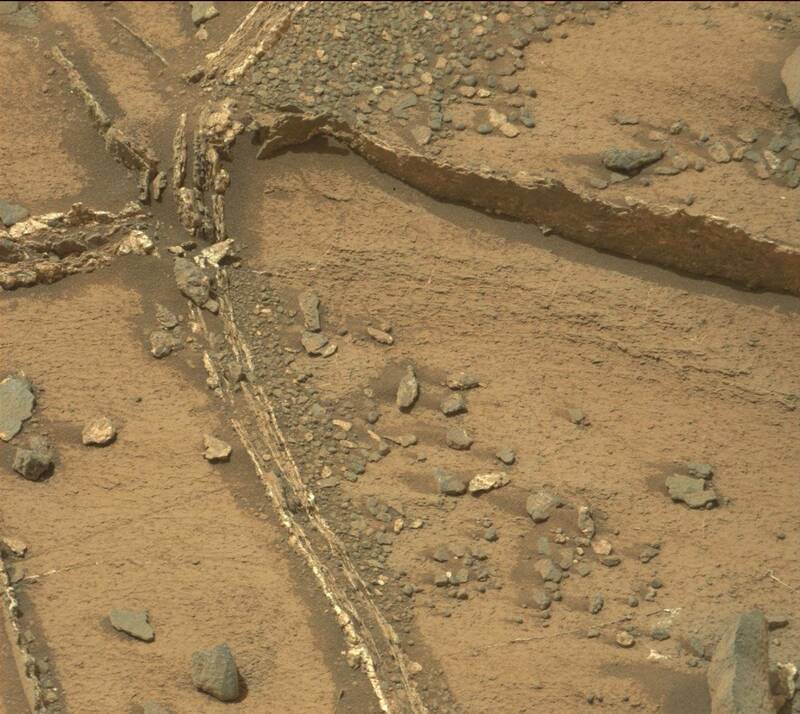 The presence of mineral-filled cracks tells us that there were a series of events that occurred at this location. 1) Bedrock formation: First the bedrock itself had to form. This rock is formed of thousands of thin layers (see image below) of very small particles. This may have been either sediment slowing collecting at the bottom of a lake-bed or possibly wind-born sediment collecting in this crater basin. Either way thousand of layers were deposited. These layers must have been buried under thousands of additional layers as evidenced in the hills surrounding this site. 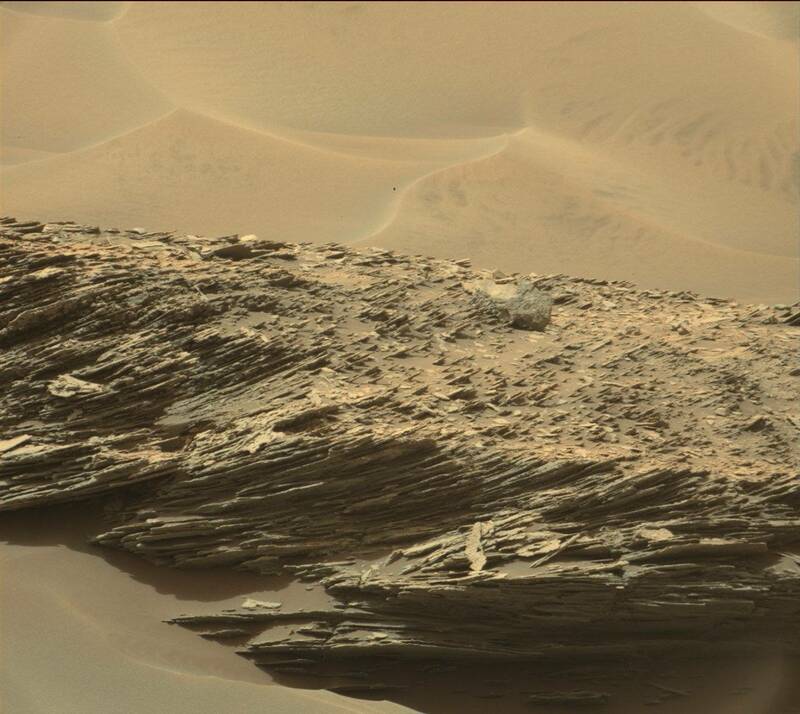 These layers were then cemented together to form rock. This usually requires tremendous pressure from being buried and large amounts of time. 2) Fractures formed in bedrock: After being converted into rock something caused this rock to become fractured. Possibly large-scale deformation of the crater caused the layers of rock to fracture or maybe there was a nearby meteor strike. The later is supported by the presence of small craters on the floor of this large crater so we know additional meteors struck this area after its formation. 3) Fractured filled with minerals: Once fractured, ground water in the crater basin or possibly even water still sitting at the surface and saturating the rock below moved through the rock and minerals precipitated in the cracks filling them. In one of the pictures below you can see that the veins are two-toned. There is an outer dark layer with a whiter inner-layer. It has been proposed by the those studying these rocks that this is the result of a further widening of the cracks at a later time and a second round of ground water seeped into the new crack filling it with a different set of minerals. 4) Erosion of rock to expose the present surface: The fracturing and filling of the cracks in the bedrock would not have occurred right at the surface. This would have occurred at least 10s of feet but probably hundreds or even a thousand feet below the surface. 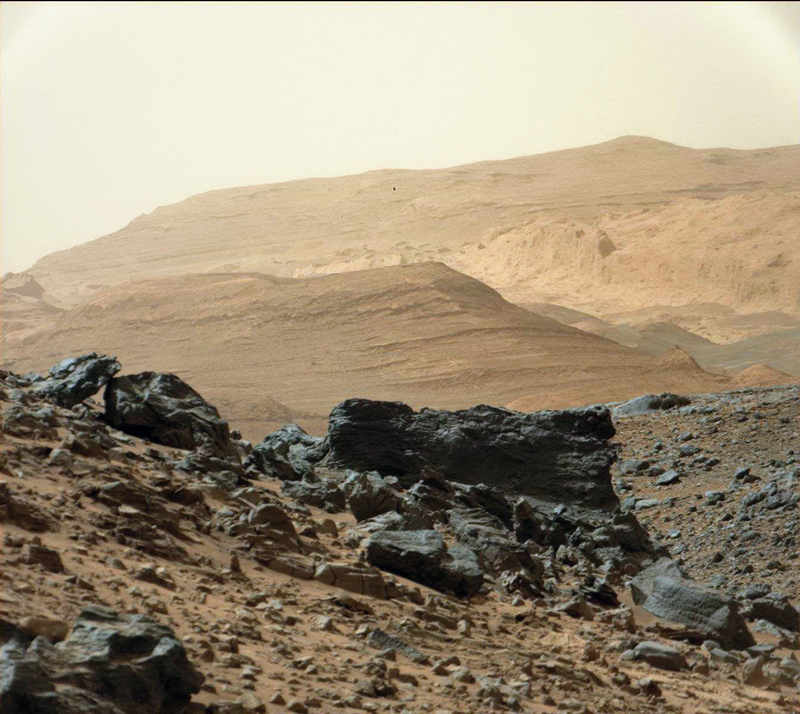 Today, the rover sits in a small valley with hills at least 20 feet high around it. These hills are composed of rock layers which are also fractured and have veins filled with white minerals. Minimally, 20 feet of rock had to have been eroded to expose the present surface. 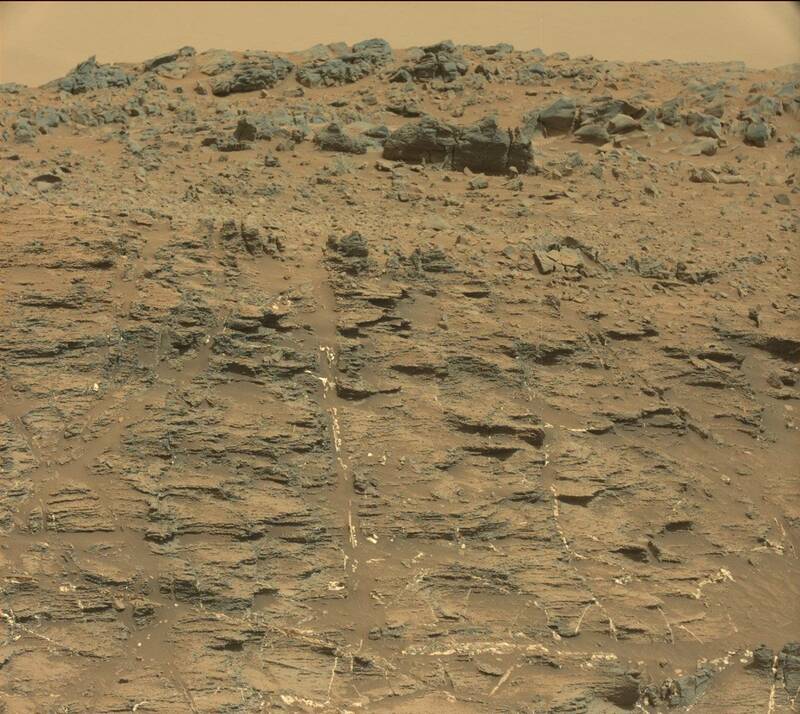 It is more likely that hundreds of feet of rock have eroded from this entire region to form the small hills and valleys that Curiosity is now exploring. Below is a picture of the side of a hill. The same white veins are running vertically and horizontally through the hill. The extent of the veins is difficult to determine because of the ubiquitous red dust that blankets the surface on Mars and obscures the color differences in the rocks. In the image below if you look carefully you can see mountains in the distance. These represent the rim of Gale Crater. The crater that the Curiosity Rover sits in is 96 miles in diameter and the rim rises up in some places over 15,000 feet above the crater floor. These mountains are probably 10 to 15 miles from Curiosities current location. 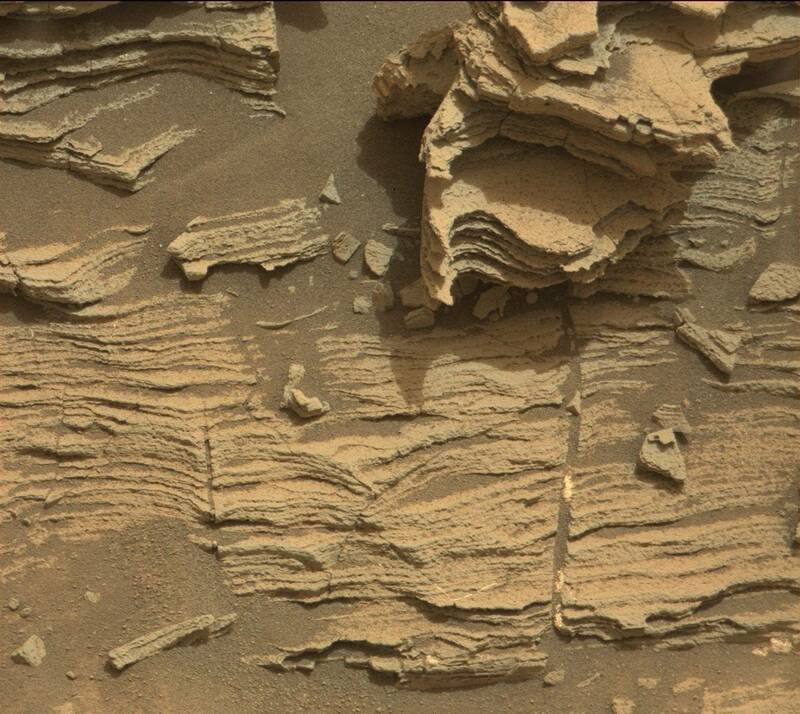 Below is one of the clearest examples of an unconformity yet seen by the Curiosity rover. Wikipedias’s definition of an unconformity: “An unconformity is a buried erosional or non-depositional surface separating two rock masses or strata of different ages, indicating that sediment deposition was not continuous.” Here we see a thick layer of lighter colored rocks sitting below layers of darker horizontally layered rock. You can’t see it from here by the lighter rocks are the same as the image just above with thousands of think layers but all of these layers are dipping down rather than horizontal with respect to the crater floor. Where these lighter rocks then meet the darker rocks on top then these lighter rock layers must have been eroded to form a horizontal surface prior to the darker layers being deposited. This is a classic unconformity and strongly suggests non-continuous sedimentation and thus a gap in time between the origins of the two layers of rock. Below is another unconformity but it isn’t a dramatic. 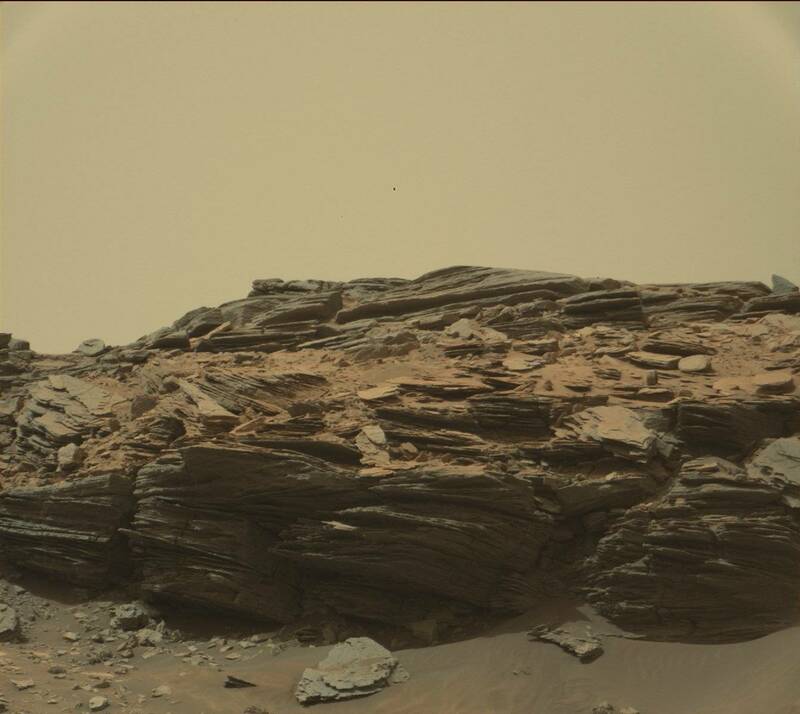 Here you can see three sets of thinly layers rocks each of which lies at different angles. Even within one set of layers those layers seem to not be all horizontal to one another. 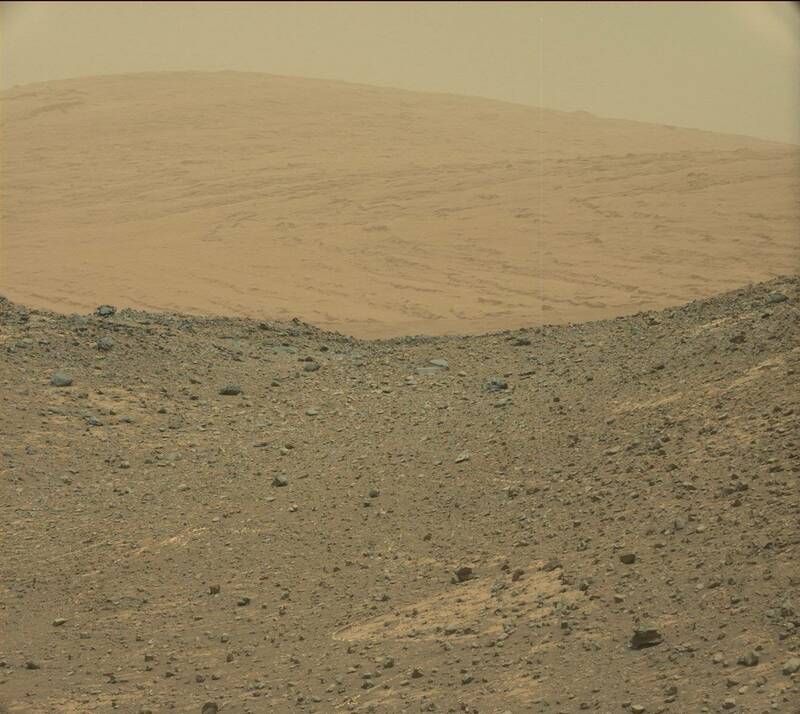 This is possibly a fossilized sand-dune. The unconformities don’t have to represent huge breaks in time but rather represent the time between the partial erosion of a dune and then the reformation of a dune on top of the remains of a previous dune. This happens as dunes are moved around by the wind. But to convert this into rock, the entire dune complex had to be buried under large volumes of additional material and then probably soaked in water to cement the particles together to form the rock we are seeing today. Below is another example of thinly layered rocks. 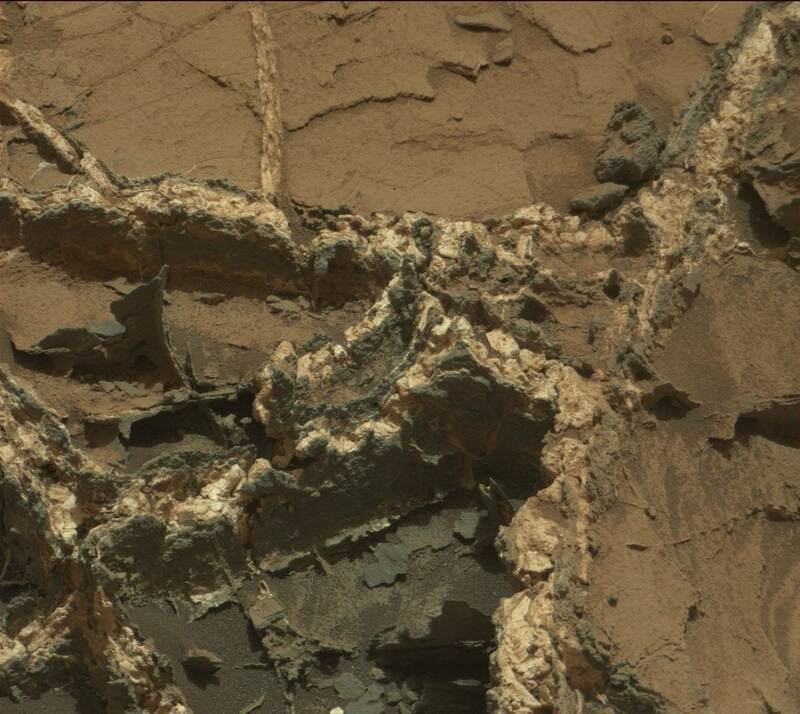 If you look closely all the thin layers of rock do not lie parallel to one another but rather seem to change their orientation toward the bottom of the image. 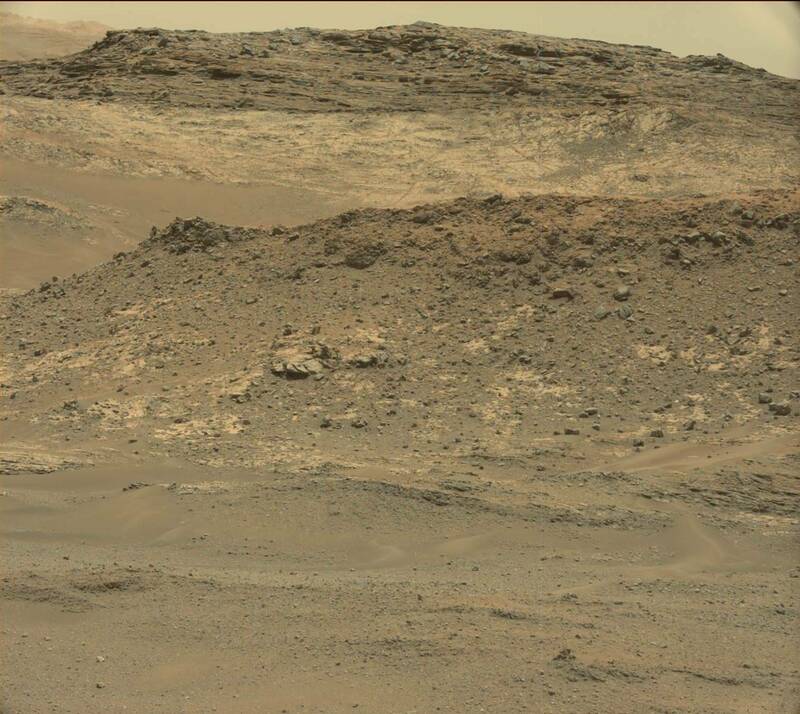 This may be another example of a dune formation or it could be that the whole set of rock layers has been deformed (ie. bent) over time due to pressures it experienced while this entire area was buried under hundreds of feet of rock. It is incredible seeing these images and realizing it is a different planet. I am struck by the wonders of God’s creation when I see them. I am also struck by the great difficulty this causes a Young Earth Creationist paradigm. How are we to account for THIS sedimentation? Are we to believe that a Martian Flood also occurred, and it reshaped the surface of Mars?